Now that my daughter has celebrated her 2nd birthday and the annual re-telling of her crazy birth story is behind us for another year, it’s time to get back to work on Excavation 2012. And what better way than to dive right back in with a whole plethora of randomness that I am getting rid of. 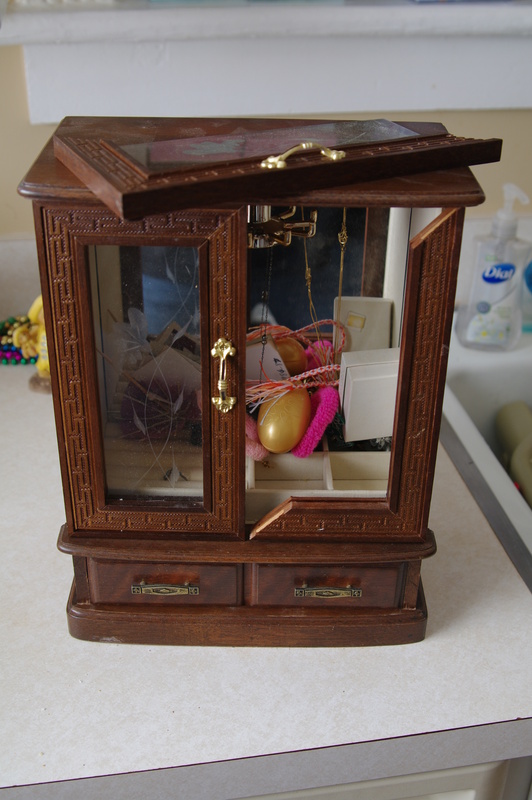 I’ve never been the type to wear much jewelry, which is why it is sort of odd that I’ve actually saved my old jewelry box for so many years. Granted, it has been packed away in a box in my parents’ cellar since I left for college in 1998, but I still can’t believe it survived this long. Well, maybe “survived” isn’t quite accurate, since the door fell off and the glass cracked the minute I pulled it out of the box. 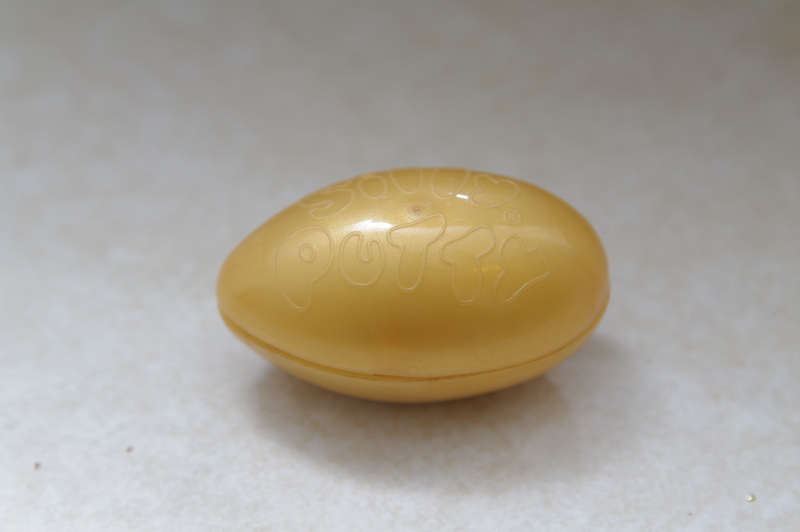 Ah, Silly Putty! Who doesn’t love silly putty? You can squish it, flatten it, roll it into a ball and bounce it, knead it around in your hands. It’s just hours of mindless fun. Apparently, it also has a shelf life that is less than 14 years. 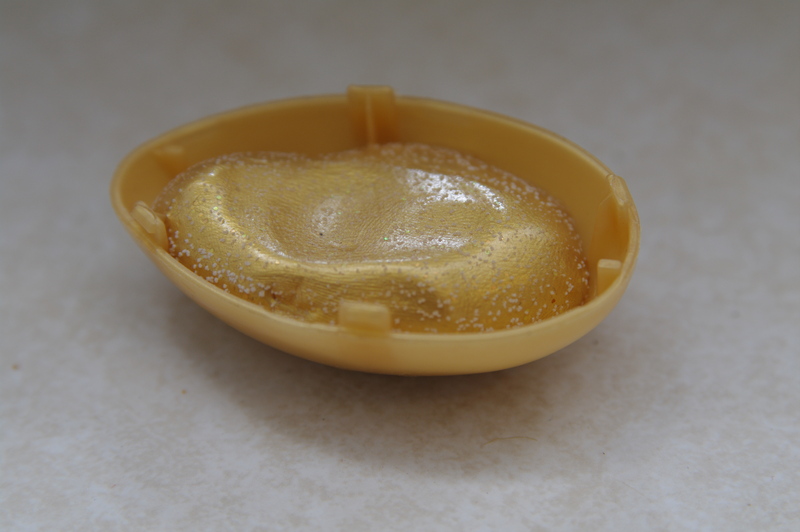 I took one look at the nasty white stuff growing on my old Silly Putty and threw it straight in the garbage. Next, I found a bunch of old school photos. Let’s see, there’s me circa 2nd grade (behold the mullet! ), some kid I don’t recognize, another kid I don’t recognize, a baby I don’t recognize, me again, a girl named Crystal (aka Cricket for short), and another girl I don’t recognize. 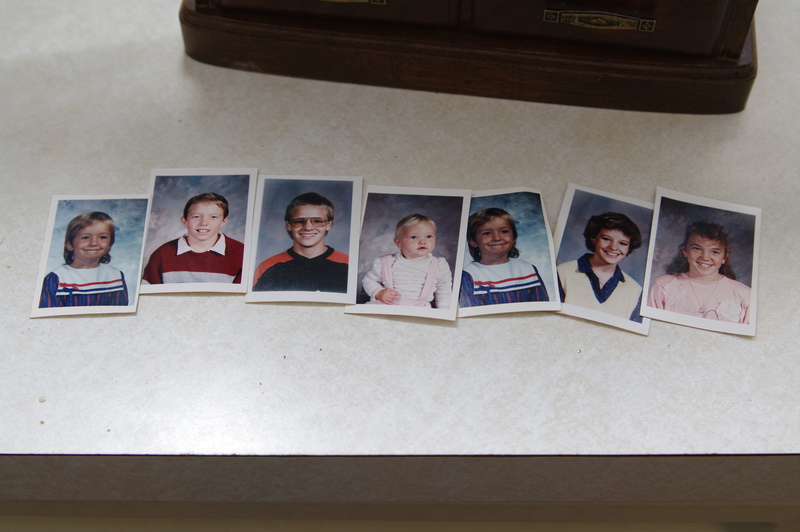 Seeing as how these photos have been sitting around since the 80’s, I think it’s time to let them go. 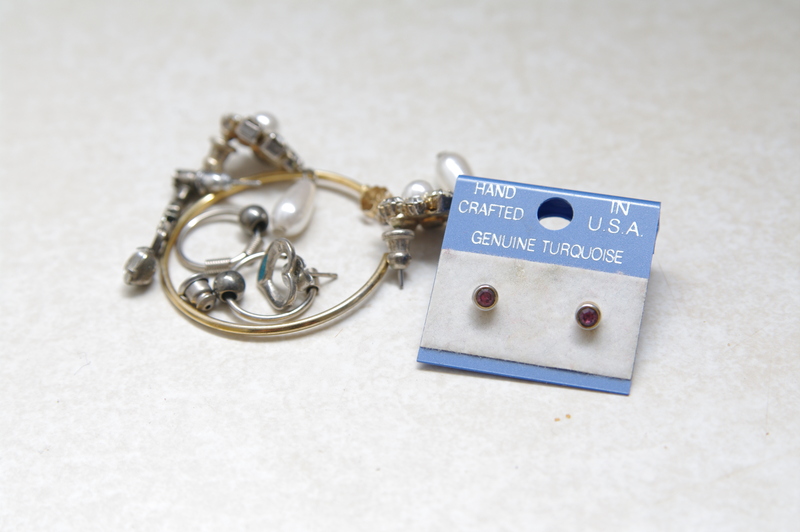 I’m pretty sure that I have worn earrings less than 10 times in my entire life–to proms and Homecoming dances, to my wedding, and for the required 8 weeks after first getting my ears pierced at age 5. For all the years that I haven’t worn earrings, I’m really quite shocked that the holes haven’t grown shut, but they haven’t, which means I can still shove a pair through my ears when necessary. And, if you ask me, it’s never really necessary. So, it’s time for these to go. 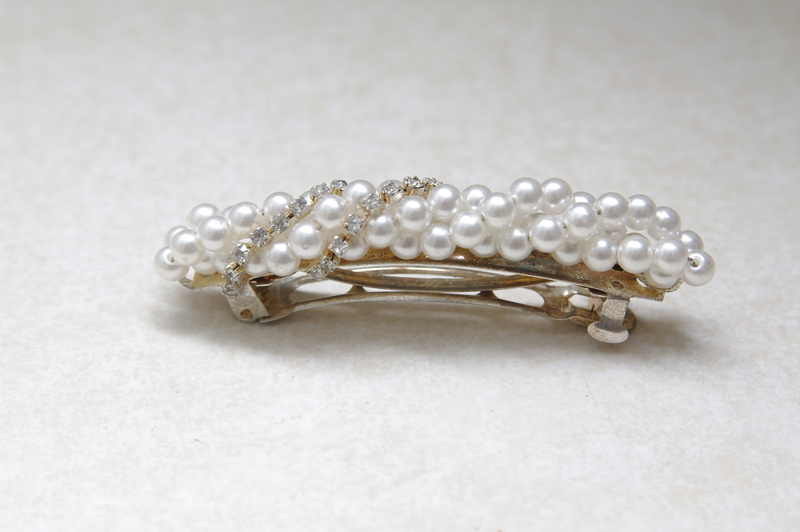 Random broken hair clip I wore exactly once to prom…goodbye! 1. Why the hell do I still have this? 2. What the hell are you supposed to do with this anyway? I mean, a patch? Really? 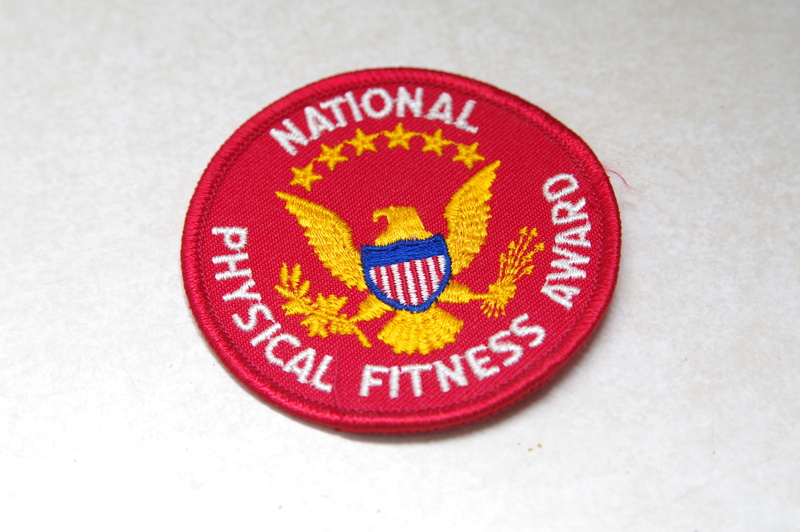 Was I supposed to sport this on my favorite jean jacket and wear it with pride or what? Lame, and time to go bye-bye. And, my random assortment of pins. 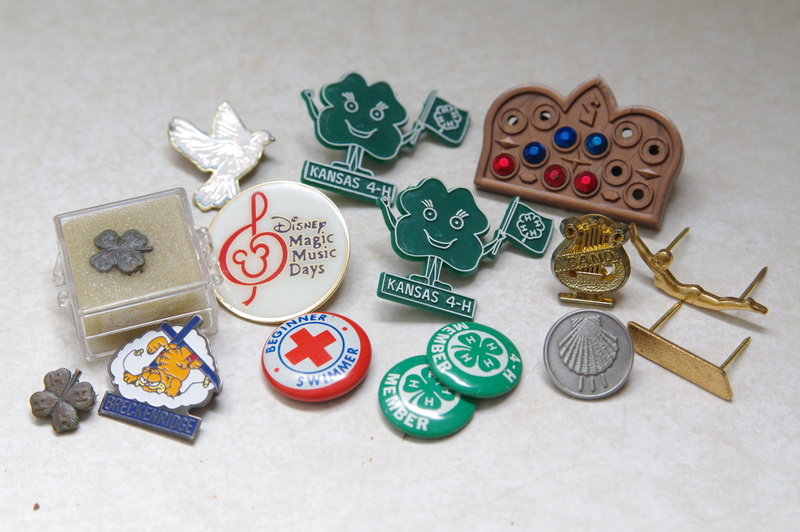 Everything from Awanas, which I attended for a short time before my family left McCook, NE when I was just 5-years-old, to the 4-H pins I received as a member of the G0-Getters 4-H club in Bird City, Kansas, to my band pin I received at Holdrege High School. I gotta admit, I’m a little torn on what do do with these since a few of them do have some sentimental value so I’ve extended their sentencing for another week to decide if I actually want to keep any of them, or just get rid of the whole lot. Maybe I need to watch an episode of Hoarders to get myself motivated.